Join now to receive 10% off your first purchase! Stay plugged in to the latest updates & discounts! To serve up the most creative, highest quality cheer apparel in the industry! 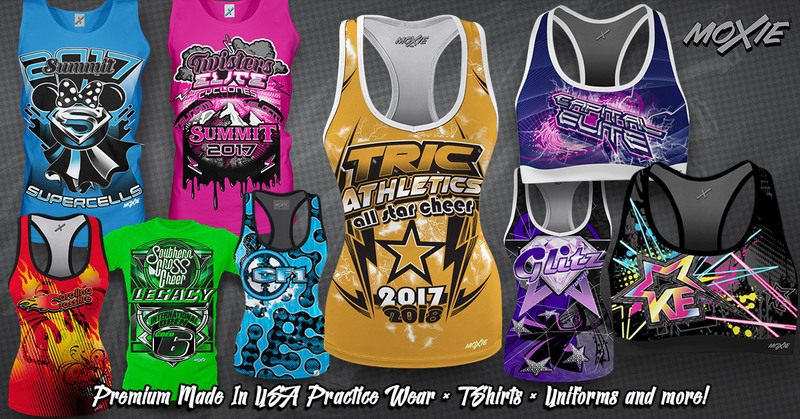 From ultra creative & unique cheerleading shirts, to premium USA made cheer practice wear, and even a unique custom built cheerleader uniform... we have the full package! Every part of the process is custom tailored to give your cheer gym or team a uniquely hot look that will help you stand out from the crowd. "When you've got moXie, you need cheer apparel to match!" Our collective design team has 5+ years experience in cheer apparel design, has designed for several well known cheer brands, and is responsible for many of the hottest designs in the cheer industry! 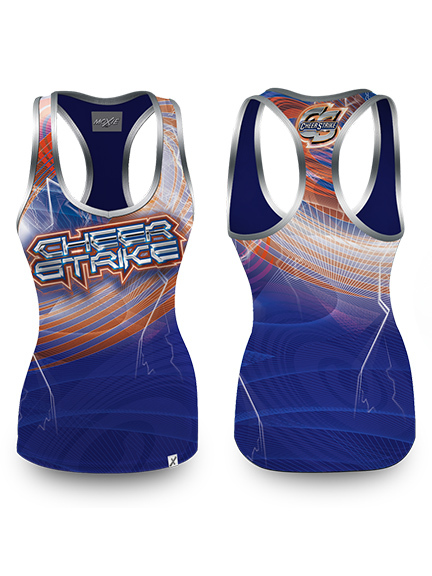 Ready to order a fresh new custom design that sets your cheer gym apart? Click on the button below to continue to our Order Process page. From there you can fill out our DRF (design request form) to get your hot new custom cheerleading shirts or cheer practice wear order in process. Our BODY FLEX cheer practice wear fabric is a premium milled in USA performance cheer apparel fabric (micro poly/4-way stretch spandex, moisture wicking, anti-microbial, soft and comfortable, very opaque to prevent see through, and PFP (prepared for print), formulated for a premium sublimation print & bright rich colors. Our cheer practice wear is somewhat modeled after the Nike Pro line of athletic apparel, for a premium look, comfort, and fit. We use only top-quality sewing methods, like using flat-lock stitching for a flat comfy feel against the skin. No harsh seams rubbing you raw! And its all MADE IN USA cheer practice wear & athletic apparel! Tired of overseas sub-par quality? Inconsistent sizing, bad sublimation printing, & long lead times? Our high quality all made in USA apparel is designed to work hard while you train hard! And our average production time on practice wear is only 4-6 weeks! Domestic manufacturing also makes it much easier for us to quickly resolve any unforeseen issues that may arise. Ready to start the design/order process? Click on the link below to fill out our DRF (design request form). We offer premium Screen Printing & DTG printing of t-shirts and other apparel. We can screen print up to 10 colors, and as large as 17" x 22" oversize prints (14" x 17" standard). We also offer shimmer/glitter inks, glow in the dark inks, individual bagging services, and more! And with our DTG digital printing, there are NO color limitations, NO minimums quantities for order, and NO screen or setup fees. And for our t-shirt orders, we use only premium quality, soft yet sturdy tees, by brands such as Next Level, LAT, & Bella + Canvas (many others available) Ready to start the design/order process? Click on the link below. 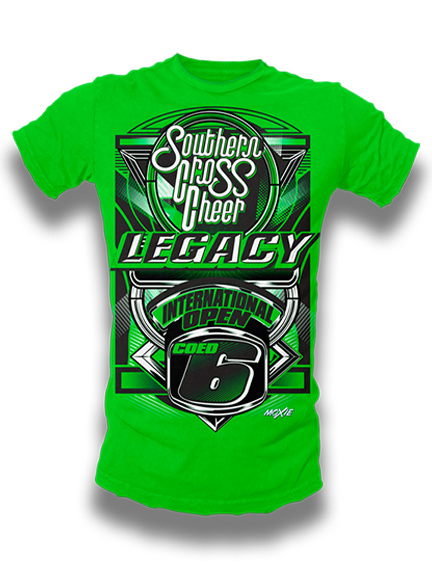 The BEST in creatively designed cheerleading shirts, premium MADE in USA cheer practice wear, and a unique custom cheerleader outfit or uniform, that sets your gym or team up to look as awesome as you perform! Let your imagination run wild, tell us what you want, and we can most likely make it happen. JOIN THE moxie COMMUNITY TO LEARN MORE! HIGH PERFORMANCE MADE IN USA PRACTICE WEAR! you need apparel to match"